A young teacher, new to teaching and to a small town school, seduced a local girl, who became pregnant. Her father and brothers were inclined to be violent men, and the teacher, unwilling to marry the girl or to say so, feared for his life if he refused. 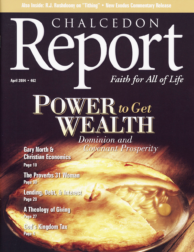 In 1979 my father, Rousas John Rushdoony, co-authored a book with Edward Powell entitled Tithing and Dominion. God’s covenant with His people includes the created universe. It is both our area of service and our material inheritance. Money is an instrument of commerce, a measure of value, a means of exchange, and storage for wealth. For many theologically conservative Christians, it seems impossible to carry on a discussion of economics without eventually referring to the work of Gary North. The prominence of Christ’s economic thought is underscored by the incontestable fact that redemption itself is an economic concept. Proverbs 31 gives us a full-length picture of an intelligent, virtuous household administrator. Her worth is far more precious than jewels, and more valuable than rubies or pearls (Pr. 31:10).